Focus on Places, Not People. Incorporate professional judgment into risk analysis, planning and strategies that are place-based and actionable. Maximize your local resources and expertise to solve problems. Geospatial Analytics. RTM diagnoses environmental conditions that lead to crime (and other problems). Focus on Places, not People. RTM adds the why to the where. ​RTM analysis brings multiple sources of data together by connecting them to geographic places. It adds context to ‘big data’ and forecasts new risk patterns for certain areas. 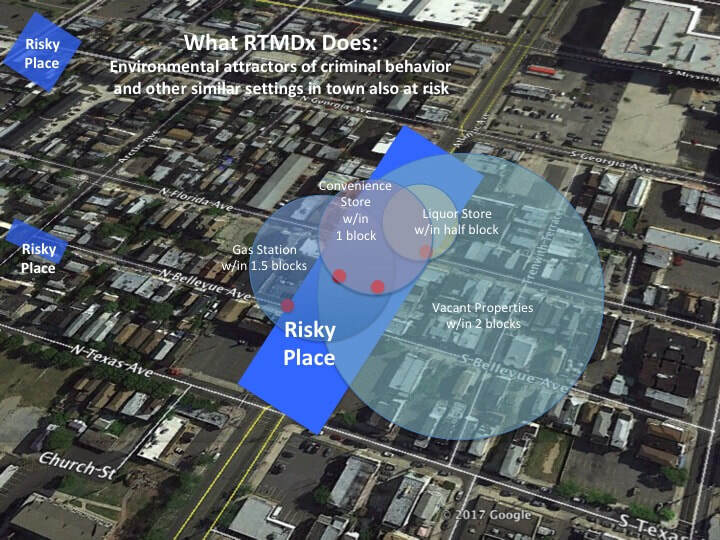 As an example, RTM identifies what features in the environment attract crime. This diagnosis makes very accurate forecasts that police use to deploy resources, prevent crime, and reduce risks. 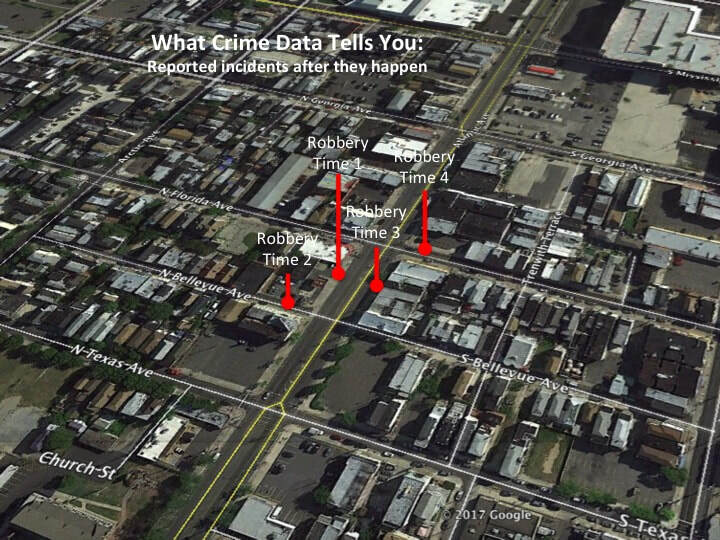 ​With RTM, city officials know the “where and why” of crime, and what to do when they get there to address it -- without the harms of over-policing. RTM is proven to reduce crime rates and improve community relations. RTM represents an investment of over 40 years of systematic investigation, fieldwork and professional experience. It is based on scientific peer-reviewed research by Drs. Leslie Kennedy and Joel Caplan at Rutgers University. It has been tested in over 45 countries across 6 continents around the world and 35 states in the United States. ​RTM has a proven track record with successful outcomes that reflect community priorities. Here's evidence. For policing, RTM identifies risky locations for crime, enhancing the situational awareness of law enforcement. 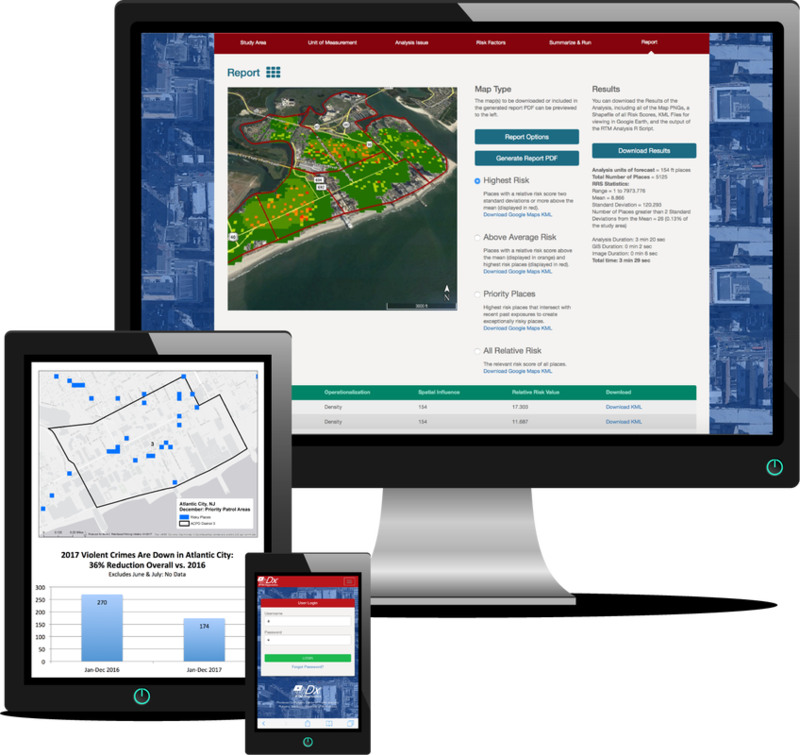 It provides real-time risk assessments about the context of crime incidents, offering strategies to prevent similar outcomes from future escalation.